Collapsible pop up displays are easy to assemble and provide fast and stylish ways to display messages in trade shows, events, retail environments and more. These portable displays are lightweight, affordable and collapse for quick storage and shipping. Collapsible displays, while simple to use and quick to set up, feature many customizable options and sizes, as well as multiple custom graphic options to best convey branding and messaging to your audience. 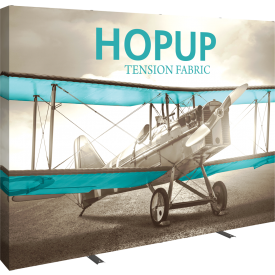 With several extensive product lines to choose from, including the popular Hopup™ tension fabric display system, Embrace™ push-fit fabric system, Xclaim™ fabric popup and Coyote™ popup, it has never been easier to find your next fast and portable, collapsible display solution. Hopup collapsible displays utilize pop up frames and pre-attached graphics for the ultimate ease of use. Displays are lightweight and available in a wide range of sizes. 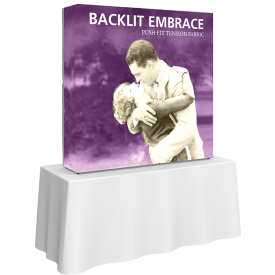 Embrace collapsible displays feature push-fit SEG graphics that easily attach to the pop up frame along the edges. With displays up to 15ft tall and 30ft wide, there's a solution for every size exhibit. Few displays offer the graphic customization options of Xclaim, with a wide variety of unique shapes and sizes that will capture the attention of your audience. 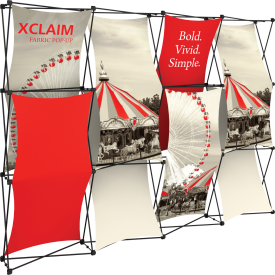 Xclaim pop up displays use a magnetic frame that sets up and stores quickly and easily. Coyote Popup displays are an industry standard, featuring purple aluminum magnetic frames and high quality graphics. 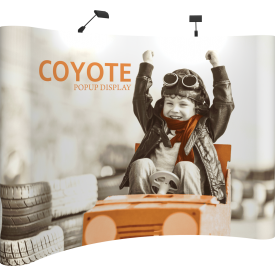 Portable and durable, Coyote is the perfect display solution.